Want to find the best value buys? 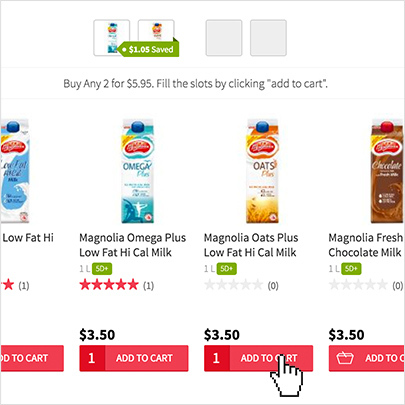 Just look out for Multi Buy Deals when shopping on RedMart! Then simply create a bundle or mix ‘n’ match items for bigger savings. We call it saving money made easy. Click on the ‘MULTI BUY DEALS’ tab at the top of the On Sale page. Any product with a blue tag means it’s a Multi Buy Deal. Click on it to find out all the products you can add to the bundle. Fill the slots with the number of items you want by clicking on the ‘ADD TO CART’ button. Look out for the green savings indicator to see how much you’ve saved! Slide to select desired number of items and tap on the ‘ADD TO CART’ button. Click on the ‘ADD TO CART’ button to add your desired items to cart. Look out for the green savings indicator to see how much you’ve saved! Simply tap on the ‘ADD TO CART’ button and select your desired number of items.